Taipei, Sept. 18 (CNA) The five laureates of the first Tang Prize were touted Thursday for their innovation, leadership and contributions to science and the humanities by other leading scholars at an award ceremony in Taipei. Lee Yuan-tseh, a Nobel laureate who convened the panel of judges for the Tang awards, called Gro Harlem Brundtland, former Norwegian Prime Minister and Tang laureate in sustainable development, "an inspiration to us all." Brundtland saw a better future for the world and did everything within her power to "steer humanity toward it," the former president of the International Council for Science said when introducing Brundtland at the ceremony. He said the "Brundtland Report" in 1987 laid the groundwork for the 1992 Earth Summit and its definition of sustainable development remains the most authoritative of the term. Ting Pang-hsin, an academician at Academia Sinica, meanwhile, touted Chinese American historian Yu Ying-shih's scholarship as redefining the study of Chinese history. Books and papers by Yu, Tang laureate in sinology, have reassessed previously held beliefs and brought new ideas into the field of sinology, Ting said. Yu's groundbreaking work on Chinese intellectual Zhu Xi reinterpreted the intellectual and political history of the Song Dynasty, he said, calling Yu a modern public intellectual who seeks to change the world through his research. In his introduction of the Tang laureate in rule of law - Albie Sachs, a former justice of the Constitutional Court of South Africa, Lance Liebman, the William S. Beinecke Professor of Law at Columbia Law School, said "no person symbolizes the good and necessary role of the rule of law better than Justice Sachs." Calling him modest and sensible, the former Dean of Columbia Law School said Sachs had stood for racial equality since he was a teenager and had fought vigorously for justice as a young lawyer, even when it meant daily risk of violent punishment. "He is a world leader of the rule of law," Liebman said of Sachs. Kung Hsing-jien, an academician at Academia Sinica, meanwhile, touted immunologists James P. Allison of the United States and Tasuku Honjo of Japan, who shared the Tang Prize in biopharmaceutical science, as "giants in immunotherapy." They have unlocked mysteries and offered new hope in the fight against cancer, Kung said. The five laureates were presented with medals and diplomas by President Ma Ying-jeou at the award ceremony held at the National Sun Yat-sen Memorial Hall. 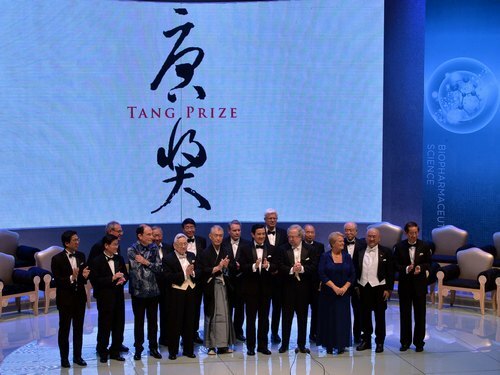 The Tang Prize was established in 2012 by Taiwanese entrepreneur Samuel Yin to honor leading achievers from around the world in four fields: sustainable development, biopharmaceutical science, sinology and rule of law. Laureates are selected based on the originality and impact of their achievements, irrespective of nationality or ethnicity. The categories of awards are not covered by the Nobel prizes, and the amount of money given for each award is also greater than that of the Nobel.